Two girls form an unlikely friendship due to their love of a popular MMORPG. White teen Kat and her family have relocated from Ontario to Alberta to be closer to her ailing grandfather. But Kat has more to deal with than the regular new-girl awkwardness—she has panic disorder. Socializing is difficult, but Kat finds a haven in Legends of the Stone, a popular game not unlike World of Warcraft. In LotS, she can safely build her own underwater castle and interact with strangers without fear. 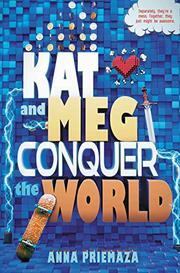 Enter Meg: a black teen with ADHD who becomes Kat’s science-project partner. Meg is the opposite of Kat; she’s boisterous, impulsive, and extroverted. Luckily, Meg is a huge fan of LotS too, and though she watches the action rather than taking part, she’s enamored with a famous YouTube streamer called LumberLegs, cementing the girls’ bond. Over the months before their deadline, the girls learn each other’s struggles and act as mutual support as they face myriad challenges: Meg feels abandoned by her stepfather and worries she’s unlovable, while Kat grapples with her intense fear of putting herself out in the world. In a sea of romances and adventure stories, Kat and Meg’s relationship adds a much-needed portrait of the importance of female friendship in an overstimulating, modern world.